Mtssa. 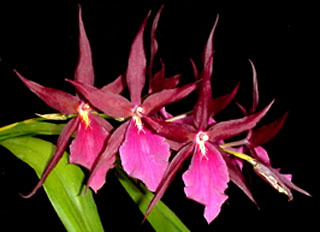 Royal Robe 'Jerry's Pick' HCC/AOS These flowers are more than six inches tall. I've had as many as eight flowers on one spike. Most of the time you will get two spikes per pseudobulb. This plant throws multiple leads on nearly every growth and becomes a big plant in a hurry. This plant is blooming in July but, I've seen it bloom in spring and fall too.